The Akitu festival was one of the oldest Mesopotamian festivals, dating back to the middle of the third millennium BC. It was during this twelve day ceremonial event, which began at the first New Moon after the Spring Equinox in March/April, that a unique tradition took place in order to humble the king and remind him of his role to serve the will of the god Marduk in order to properly provide for the community. The head priest would strip the king of his regalia and slap him hard in the face. The Babylonians believed that if the king teared up, Marduk approved him to be king for another year. 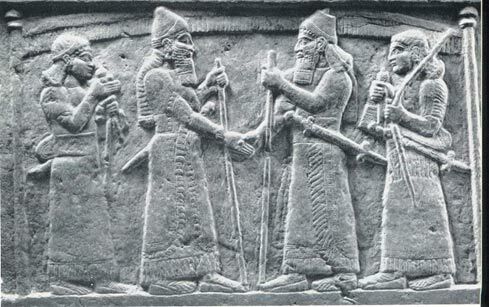 In a featured article about the ancient tradition of slapping the king, The Jerusalem Post writes: “It might be interesting to note that a great Babylonian king like Nebuchadnezzar II (605-562 BCE), well known in our chronicles as the destroyer of Judea and of the First Jerusalem Temple in 597 BCE, the mighty conqueror of the entire ancient world who considered himself to be the king of kings, would willingly and meekly, once a year, submit himself to such a humiliating procedure”. Yet the ceremonial removal of the king’s power was considered a vital procedure to reaffirm the bond between the community and the gods, the community here being represented by the king in temple ritual. Front of the throne base of Shalmaneser III of Assyria, showing the Assyrian king and Marduk-zakir-šumi I of Babylon shaking hands in a public display of Assyro-Babylonian friendship. From Kalhu. Iraq Museum, IM 65574. Image source: University College London . The Akitu festival was dedicated to the rebirth of the sun god Marduk, one of the chief gods in the Babylonian pantheon, who was believed to have created the world out of chaos. To prevent the god of chaos from regaining control, the New Year ceremony re-enacted the original victory of Marduk over the forces of destruction. It began with a great procession that included the king, members of his court, priests, and statues of the gods passed through the Ishtar Gate and along the Processional Way to the “Akitu” temple, dedicated to Marduk. 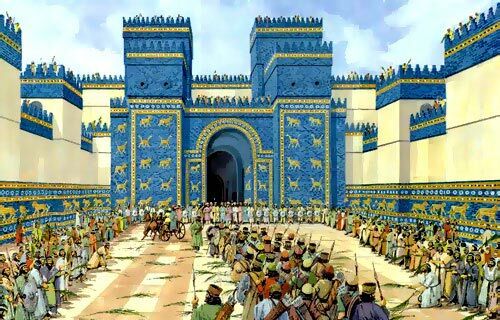 The Akitu Festival began with a great procession through the Ishtar Gate towards the temple of Marduk. Image source. On either the fourth day of the festival, the king was to face his trial. The high priest greeted the king before temporarily stripping him of his crown and royal insignia, and dragging him by the ears to the image of Bel, in front of whom he was required to kneel. The king was required to pray for forgiveness and to promise that he had not been neglectful of his duties. A steady flow of tears assured the priest and the people the king’s reign would be prosperous and his crown and royal regalia were returned to him. As well as testing the gods’ approval for his reign, the hard slap was intended to remind the king to be humble and to inspire him to remain focused on his duties and obligations towards his people and his gods. The Akitu festival endured throughout the Seleucid period (312 – 63 BC) and into the Roman Empire period. Roman Emperor Elagabalus (r. 218-222), who was of Syrian origin, even introduced the festival in Italy. A number of contemporary Near Eastern spring festivals still exist today. Iranians traditionally celebrate 21st March as Noruz (“New Day”). Somewhere along the line, the king slapping tradition faded into obscurity. Nevertheless, there seems to be great value in a ceremony that humbles a nation’s leader and reminds him or her of their duty to serve their people with honour. Featured image: Marduk-apla-iddina II (left) as king of Babylon in 715 BC, as depicted on a monument commemorating a royal land grant (kudurru). Vorderasiatisches Museum Berlin, VA 2663. Reproduced from L. Jakob-Rost et al., Das Vorderasiatische Museum, Mainz 1992, 109. Image source: University College London . Beating oneself is still practiced in some religion...so this must be an older version. I agree Rabi. If history had been this interesting in school I wouldve definately paid more attention to it and made straight A's. As it was I barely passed because it could not keep my interest but now I cant get enough of it. History as I knew it , is almost as if am learning all over again, it's amazing , finding out with facts what I knew then could be wrong. Indeed...you beat me to it flooring except it's just one individual I had in mind...maybe they could smack him six times and an extra to "grow on"? Wow! We really need to do this twice a year to everyone in the White House.